This will also my first time to draw these funny characters Pinky and Spiky. They went in the jungle to feed the wild animals. Well, Spiky is just bringing a piece of carrot. 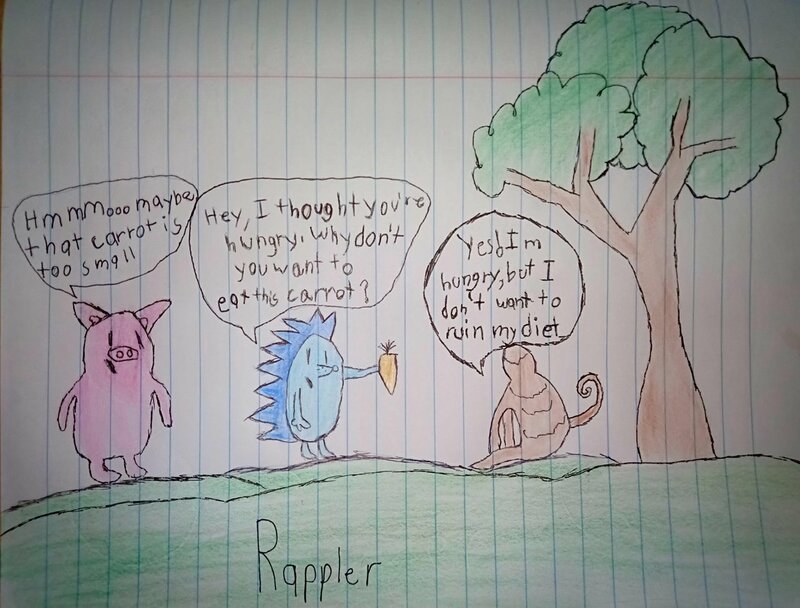 I don't have an idea if he can feed all the animals in the jungle with that carrot. While they are walking they met an extraordinary monkey that looked so hungry. They even heard its stomach growl..
Spiky decided to feed the monkey. But the monkey is not getting it nor looking at the carrot. So Spiky became curious about it. The monkey looks so hungry and yet it did not want to accept and eat the carrot. Pinky thought that maybe it's because of the size of carrot. It's not enough to fulfill his hunger. But in their surprise, the monkey has an unsual reason. It did not want to eat the carrot not because of the size. It's because the monkey is on a diet and don't want to ruin it.